ONLY 315hrs. 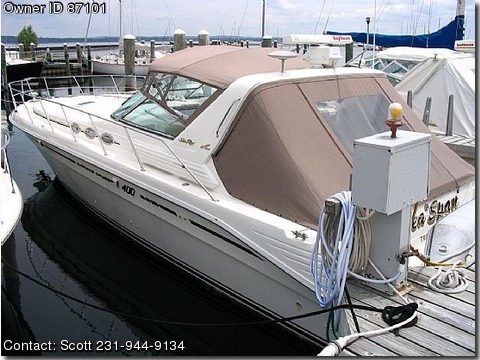 - IMMACULATE, ORIGINAL ONE OWNER, ALWAYS FRESH WATER, GRAND TRAVERSE BAY BOAT. FULLY OPTIONED, BLACK/GOLD PACKAGE, PROFESSIONALLY MAINTAINED AND METICULOUSLY POLISHED, LIKE NEW CONDITION WITH ONLY 315 ORIGINAL HOURS on the Twin MerCruiser 7.4L MPI 340-PHP gas inboard engines and only 150 hours on the 7.0kW Westerbeke Generator. Total O.A.L. including bow pulpit and swim platform 45'-7". 2-Zone Air-Conditioning & Heat, Full Raytheon Electronics Package (Radar, GPS/Chartplotter, Tri-Data, etc.) Two Seperate Staterooms, and a convertible settee in the Salon. All New Canvas & Eison Glass as well as Five (5) New Batteries 6/09. This Vessel has always been kept in Heated Winter Storage. New in 96' this Vessels total base & options price came to $277,837. Newly listed and priced to sell $119,900. You won't find another one cleaner with these options and low hours for this price. Please e-mail slketko@aol.com for build/specification sheets and additional photos. Accomodations: Forward Stateroom: Privacy Door, Full-Size Inner Spring Mattress, Air-Conditioning/Heat & Ent. Center, Cedar-Lined Lockers w/Lights & Mirrored Doors, Vanity, Floor & Berth Storage. Guest Stateroom: Full-Size Bed & Convertible Upper Bunk w/Storage Cabinet & Privacy Door. Salon: Convertible Sleeper Sofa, Lounge, Air-Cond./Heat & Ent. Center, Central Vac, Head w/Vacuflush System & Seperate Shower Stall, Hot Water System, Halogen & Indirect Lighting, 120v Outlets. Galley: Flush Mount Three-Burner Electric Stove, Full Size Refrigerator/Freezer, Microwave, Sink w/Cutting Board, Gallery Convience Package: Nutone Blender and Can Opener, Space Saver Coffee Maker, Snack Bar w/(2) Stools. Electronics and Navigational Gear: Raytheon: R41XX-Radar, 202 VHF/Hailer, Raydata;Depth-Speed-Temp, NAV 398 GPS/LORAN, Raychart 600XX-Plotter, C-Map Chart Cartridges, Compass, Navigation Lights, Clarion Premier Audio Option: CD Changer, Bose Speakers, Sub-Woofer & Remote cockpit control. Electrical System: Emergency Start System, Dual 30 AMP/120V/60 Cycle Dockside Power w/50' Cords & Adapters, 120V/12V Converter, Crossover Charging System, Systems Monitor Panel, 7.0kW Westerbeke Generator w/Remote Start/Muffer/Fresh Water Cooling, Co2 Detectors, Five (5) New Batteries 6/09. Deck and Hull Equipment: Three (3) Deck Hatches w/Screens & Covers, Swim Platform w/Contoured Fender Storage Box & Stainless Steel Ladder and Grab Handles, Adjustable Double Helm & Companion Seats, Cockpit Table, Snap-In Cockpit Carpets, Chain & Rope Lewmar Windless w/Helm Control & Bow Pulpit Foot Switches, ACR Remote Controlled Spot/Search Light.